The No. 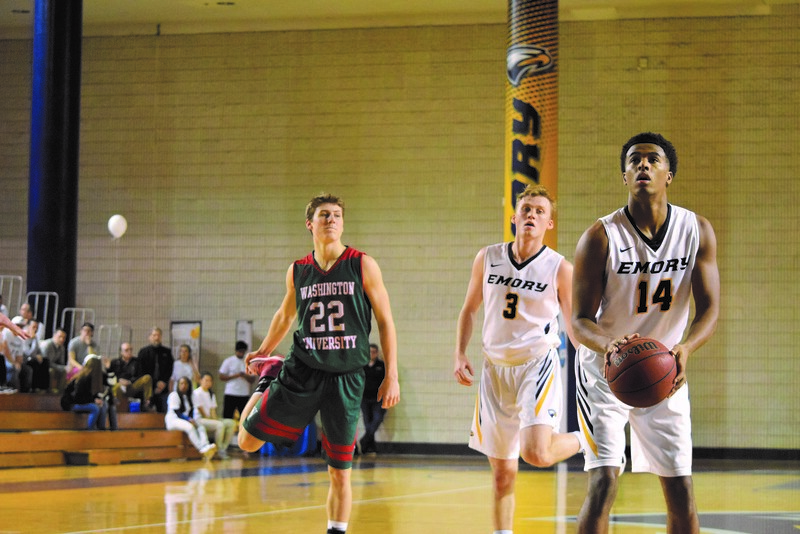 15 Emory men’s basketball split a UAA rematch weekend against the University of Chicago (Ill.) and the University of Washington in St. Louis (Mo.). With hopes of reclaiming at least a share of the UAA lead, Emory checked the UChicago Maroons 66-61 Feb. 2 but suffered yet another loss against the No. 2 WashU Bears 82-69 Feb. 4. After the Eagles won their first game against UChicago (8-11) in the WoodPEC Jan. 26, the team once again proved their dominance on the road. Senior center Christopher Avant and freshman guard Romin Williams led the way, scoring 17 points each. Avant finished the night shooting an efficient 7-10 from the field, including 3-3 on his three-point attempts. 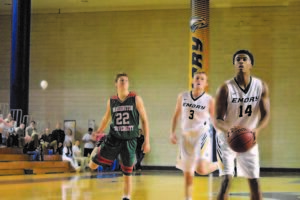 Williams, Emory’s leading scorer, ended 7-15 shooting, notching his fourth consecutive double-figure scoring outing. In an overall close match, the Maroons led 35-33 at halftime. In the second half, the Eagles went on a quick 10-2 run, thanks to junior guard Gebereal Baitey (10 points, 5-8 shooting). Baitey contributed a quick six points during that stretch with a pair of layups and a jump shot. But the Maroons retaliated with a pair of jump shots from junior guard Noah Karras, who finished the game with a team-high 17 points. After the teams tied at 45 points each, the Eagles secured the lead after Williams converted a triple off an assist by senior guard Whit Rapp. Later in the game, the Eagles went on a 7-2 run to push their lead to eight points. While the Maroons hung close, a triple by Avant all but sealed the match for the Eagles. On Sunday, however, the Eagles struggled against a dominant and UAA-undefeated WashU (18-2, 9-0 in UAA). Freshman forward Matt Davet led the Eagles in scoring, notching 13 points on 5-10 shooting. Rapp and Williams followed, contributing a dozen points each. In the first half, it seemed as though the pair’s offensive contributions could bring the Eagles to victory. Davet and Rapp poured a couple three’s and went on individual runs that gave Emory a 38-37 lead into the break. But the Bears took complete control during the second half. WashU started the half with a blazing 13-5 run and an onslaught of layups that erased Emory’s fleeting one-point edge. While the Eagles cut the their lead to four following an and-one three-point play by Williams, that was the closest they would get for the rest of the game. The Bears ended up outscoring the Eagles 45-31 in the second half, shooting 59 percent in the last 20 minutes. The Eagles, on the other hand, were ice cold. They converted only 33.3 percent of their field goal attempts with only two of 20 three-point shots. The Eagles now stand at 16-4 overall, 7-2 in UAA play, good for No. 2 in league standings. The team will play at last-place Carnegie Mellon University (Pa.) Feb. 9.